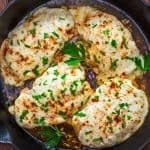 This easy, one-pan Three-Cheese Chicken recipe requires just a few ingredients and almost no clean-up. 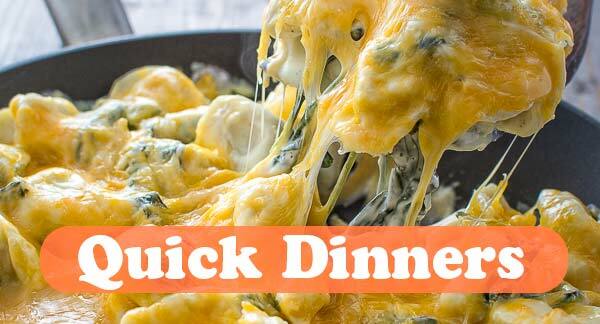 Make this perfect weeknight dinner in just 25 minutes! 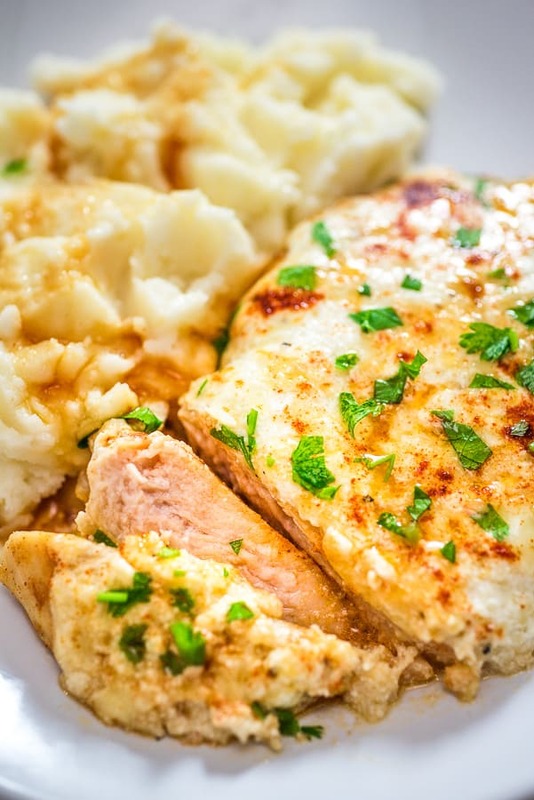 Tender, pan-seared chicken breast topped with a garlic-infused mixture of mozzarella, Parmesan, and ricotta. Who can say no to that? 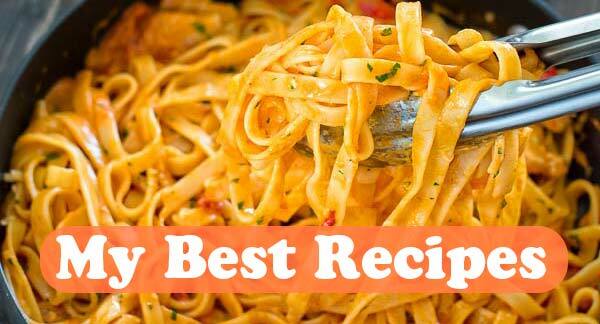 My family loves this recipe, and I think yours will feel the same way. 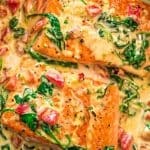 This dish comes together in a snap; it is simple enough for busy weeknights and special enough for guests. 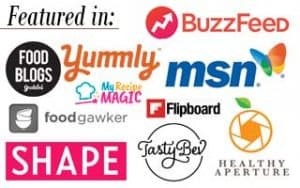 Let’s discuss the ingredients used in this recipe. 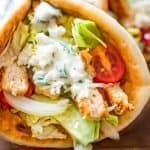 Chicken breast will work best in this recipe. You’ll need two chicken breasts, which will be cut in the middle to make four thinner chops. I recommend pounding the chicken a bit, to even out the thickness. This will help the chicken to cook faster and more evenly, and it’ll help you to relieve the mid-week tension. Win-win! As the recipe name suggests, we’ll need three kinds of cheese in this recipe. Mozzarella (a.k.a. the melty goodness). Low-moisture, shredded mozzarella is going to work best here. 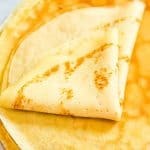 However, it can be substituted with Gouda, Provolone, Asiago, or Cheddar cheese. Parmesan (a.k.a. the flavor goodness). Try to use good-quality Parmesan cheese. It makes a world of difference! Ricotta (a.k.a. the creamy goodness). 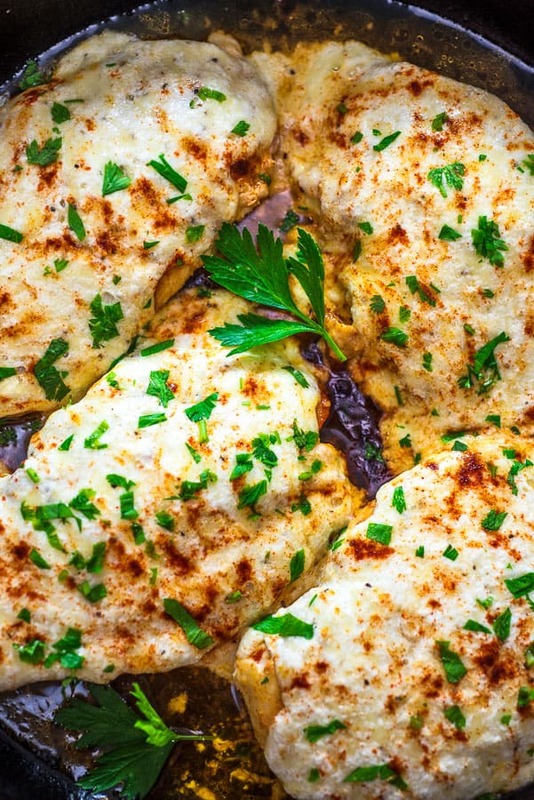 Ricotta cheese brings in a nice creamy texture to this Three-Cheese Chicken, so don’t skip it! 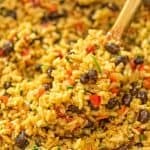 Paprika is one of my favorite seasonings, and I use it in many recipes. 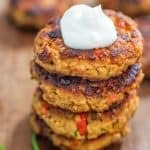 Any regular, sweet paprika will work in this recipe, but just make sure you don’t use the spicy stuff. 1. 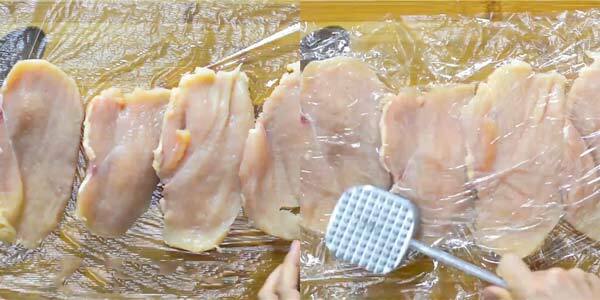 Place the chicken breasts on a cutting board and cut horizontally through the breasts. Put the breasts between two pieces of plastic wrap and pound them with the flat side of a meat tenderizer, until they appear to be of even thickness. 2. 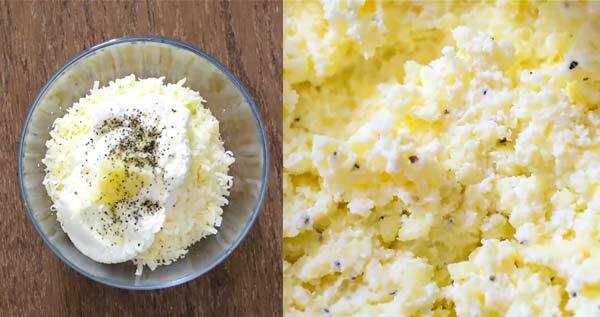 In a medium bowl, mix together the mozzarella, Parmesan, ricotta, garlic, salt, and pepper. 3. In a large skillet, heat the olive oil and butter over medium-high heat. 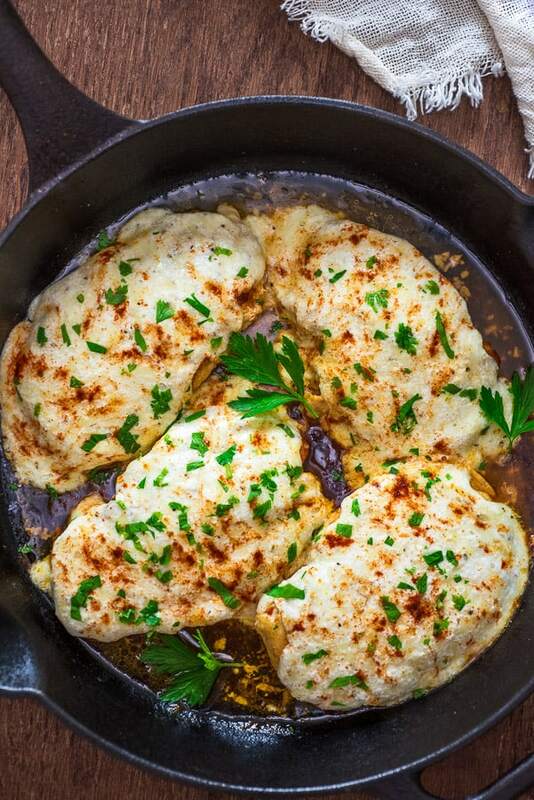 Arrange the chicken on the skillet and season it with salt and 1 teaspoon of paprika. Cook the chicken for about 5 minutes, until a golden crust appears, and then flip. 4. Divide the cheese mixture into four equal parts and spread it evenly on top of the chicken. Sprinkle it with the remaining paprika. 5. Cover with a lid and cook for another 5-7 minutes, until the cheese melts and the chicken is cooked through. Garnish with parsley and serve. Grains (quinoa, barley, buckwheat, lentils). Whatever you choose to serve it with, make sure you drizzle some of the pan liquids on top! 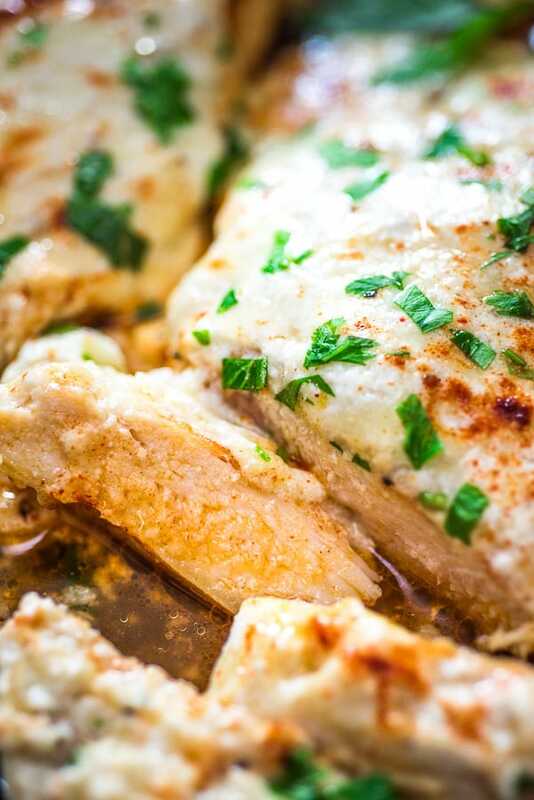 This easy one-pan Three-Cheese Chicken recipe requires just a few ingredients and almost no clean-up. 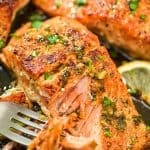 Make this perfect weeknight dinner in just 25 minutes! 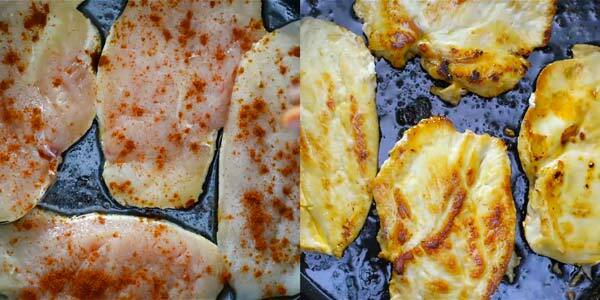 Place the chicken breasts on a cutting board and cut horizontally through the breasts. Put the breasts between two pieces of plastic wrap and pound them with the flat side of a meat tenderizer, until they appear to be of even thickness. 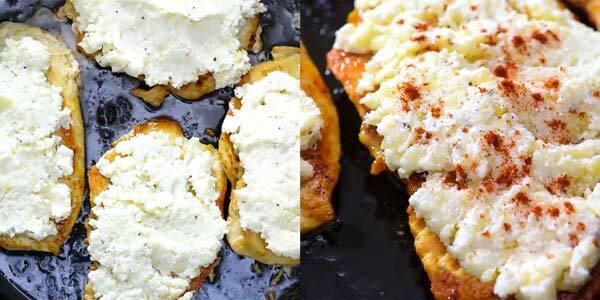 In a medium bowl, mix together the mozzarella, Parmesan, ricotta, garlic, salt, and pepper. In a large skillet, heat the olive oil and butter over medium-high heat. Arrange the chicken on the skillet and season it with salt and 1 teaspoon of paprika. Cook the chicken for about 5 minutes, until a golden crust appears, and then flip. Divide the cheese mixture into four equal parts and spread it evenly on top of the chicken. Sprinkle it with the remaining paprika. Cover with a lid and cook for another 5-7 minutes, until the cheese melts and the chicken is cooked through. Garnish with parsley and serve.